ECCO GOLF have unveiled their latest creation, the ECCO COOL PRO, which combines several of the company's flagship technologies for a combination of form and function. The new Ecco Cool Pro shoes combine the performance focused Spyder-grip outsole (first debuted in the ECCO Cage Pro), with their Gore-Tex surround technology that was first seen in the Ecco Cool. The Spyder-Grip outsole utilises an organic structured design for outstanding grip, and this combines in the new Ecco Cool Pro shoes with a Gore-Tex Surround membrane upper which facilitates an advanced air channeling system within a grid-shaped sole structure, providing 360° breathability without compromising on waterproof protection. 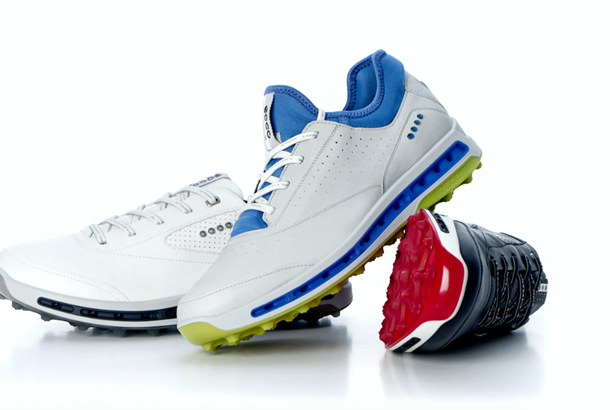 As explained by the Michael Waack, Head of Global Golf at ECCO, the combining of these two technologies in the ECCO Cool Pro shoes has been designed to increase stability, comfort, breathability and protection. “The design of ECCO COOL PRO represents the exciting combination of two key innovations which will provide golfers with increased levels of comfort, breathability and protection,” said Waack. ➤ 100% GORE-TEX ® waterproof protection.